Many people in the Philippines went days without food after Typhoon Haiyan destroyed their homes. Now Samaritan’s Purse is distributing rations large enough to feed families for a month. Throughout Tacloban, there are dozens of signs asking for help. People are in dire need. Give Life-Saving FoodOne woman who needed help was Analiza Mendoza. She described the typhoon winds like a tornado. The ocean, which is typically more than two kilometers from her home, rose all the way to her neck. Analiza came close to drowning in Typhoon Haiyan. When the storm ended, nothing was left. She and her husband didn’t know how they would care for their four children. Mendoza thought the worst was over, but her troubles continued. It took responders days to get relief goods to the affected areas. Roads were covered in debris. After a few days, Mendoza began thinking she would die of starvation, but her husband comforted her. 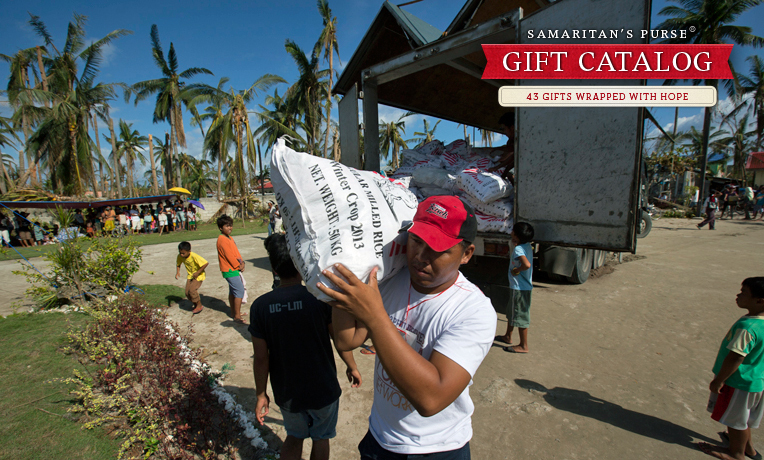 Samaritan’s Purse is one group working to meet the needs of survivors like Mendoza. We are partnering with the World Food Programme to distribute 1,000 metric tons of rice to 17,000 families on Leyte and Banatayan Islands. The team has begun distribution and is eager to get the food out. Every family who comes to our distributions will receive two rations, each one sufficient to sustain them for two weeks. 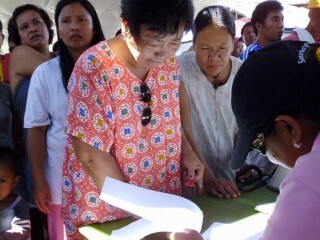 After the typhoon, local markets collapsed, making it impossible for the population to satisfy its basic needs. While the local government is working tirelessly to reestablish order, it will take some time before the situation is stabilized. In the meantime, people are in critical need of aid. Famlies lined up to register for the distribution. With the food distributed by Samaritan’s Purse, one family will have enough food for four weeks. Mendoza came to our distribution to collect food for herself, her husband, and their four young children.